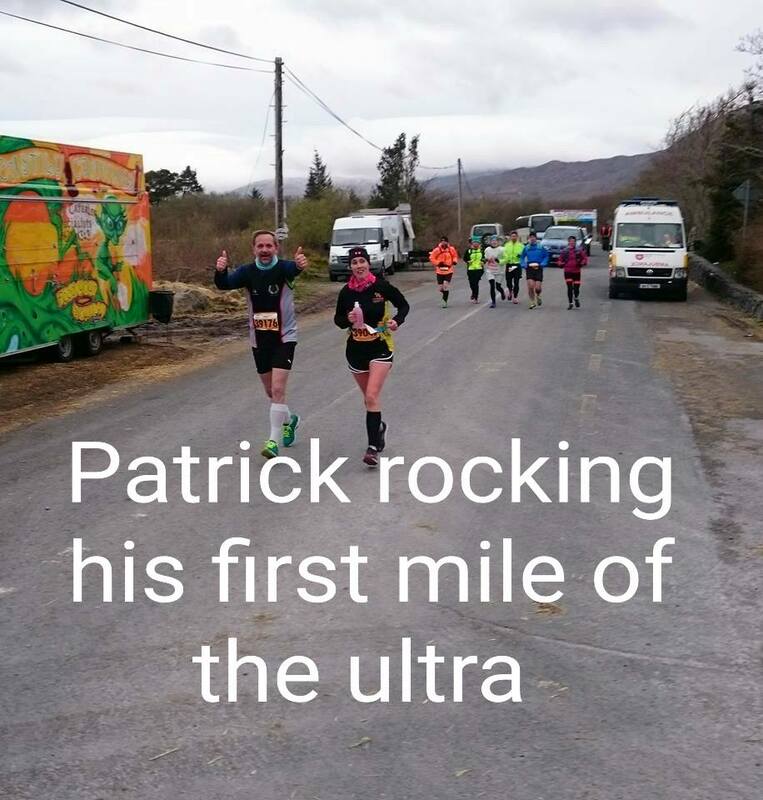 This month Patrick Mercie ( This blog is reproduced for Limerick Company Blog with his permission) takes on his first Ultra Marathon, the same weekend as we were all hiding from the terrible weather! His blog is an inspiration for those looking for running inspiration and for those seeking coaching and success coaching. Collected the number in Galway on Saturday Lunchtime and had an ‘unhealthy’ Lunch of chips, beans and sausages. I know what works for me. Headed of to the B&B I used the last 2 years for the Connemarathon Full. Waterfall Lodge just outside Oughterard is a gem of a B&B. And Oughterard has been Connemarathon race central for me for all 5 races there to date. (1 Half, 3 Full and now 1 Ultra). Nice meal in the Boat Inn and then to the leaba for a 6am rise. Breakfast at 6.30am as the B&B owners got up specially for it!! Left at 7am to get on the bus at Oughterard GAA pitch at 7.30am. Met Francy, Marie and Kevin from MCI on the bus and had a nice chat with Francy all the way to Maam Cross for bag drop, briefing and transport to race start. Connemarathon allows the Ultra runners to drop 3 bags with their own food at any of the water stations. I chose 19, 29 & 35 miles for my bags stuffed with Jaffa Cakes, bottles of flat Coke, Bananas, salted crisps and Bounty bars. I also wore a Flipbelt (get one if you run long distance they are super) with sweets and a nutrition bar. Race briefing at 8.15am. Roads are open for first 26 miles so run on left. And Enjoy!! (Didn’t hear the rest as the mind was racing). We were bussed 1 mile or so back up the Hell of the West for our start. When getting off the bus the cold and wind hit us. Hoy!! That wasn’t in the plan 🙂 We started at 9. Settled into a slow rhythm and got a nice surprise seeing so many MCI members at Peacock’s Hotel after 1 mile shouting encouragements. Thanks to you all! Found myself running with Fleur Forbes, fellow MCI member and fellow first time Ultra runner. We shared our stories, encouragements and met with 2 other ladies from Kildare and 2 lads from Italy. The Italian boys ran for one of their friends who had won the Ultra twice and had developed cancer. They were going to stop for a pint in Leenane at Mile 26 to honour him. Nice story. We chatted on and the first 10 miles were dry, pleasant, nearly effortless and with wind in the back. Then we turned right into the Inagh Valley and it was like being hit by a 40 ton truck. The wind was merciless and started to mix with driving rain and later sleet and hail. We got through this to Mile 13 where I lost track with Fleur after a water station. I remember saying ‘you will catch up’ as she had a food parcel there and I didn’t want to stand still in the cold rain and wind. Thanks Fleur for the company on those 13 miles. It was pleasant conversation and made the miles disappear! I’m going to keep it simple. From there on the weather got progressively worse all the way to Mile 33-34. Because of my groin injury I had left my watch in the bag at the start and was running on feeling. There were 2 time cut offs at mile 13 (2.5 hours) & 26 (5.5 hours). Before the weather hit us I was pretty confident of making those so decided to run watch free and stop me fretting about times. This definitely worked. I love running without a watch and have ran some of my best races like that. I made Mile 13 in 2H12 and Mile 26 in 4H35 despite the conditions. We turned up the Hill in Leenane at mile 26 and I was running fine even though the last 13 miles had been energy thieves. At around Mile 28 the conditions went apocalyptic. At least that’s how it felt. We were running head into a gale force wind which for fun effect combined its force with combinations of ice cold rain, sleet and hailstones. The Brussels Marathon buff I wore in honour of those who died in the recent attacks was a lifesaver keeping my head protected. I started shivering and shaking uncontrollably. I started getting muscle pains in my upper arms from shaking. I felt my energy flow out of my body and at the water stop at Mile 29 (the only unmanned one all day yet it would have been inhumane to let someone stand there), I could hardly open my food parcel as the table it was on blew over and flew 10 or so yards away against a pole. This was crazy stuff. I felt very low and thought briefly of quitting there and then out of pure self preservation. There were ambulances driving up and down the course at this stage. Then the words came to me. Words I have said so often to myself. 3 Words. Words I got from Gerry Duffy in one of his books. ‘Control the Controllables’. Right, what can I control? Not the weather, not the temperature, no change of clothes, no protection from the wind in an open valley. I often say to clients that the answer is most times inside self. That came to me too. What inside you can you use for control? I was literally standing still in the middle of the road with my back turned to hail and wind, shaking like a leaf when these thoughts occurred. Light bulb. My breath! I can control my breath. Move forward Patrick and concentrate all you are on your breathing. I started walking and breathing consciously. Within 5 minutes I started to breathe slower and slower and my body temperature seemed to regulate itself. The shaking and shivering disappeared and my mind cleared itself of the problems that were external factors. By mile 32 I was jogging again and jogged/walked all the way over the Hell of the West climb to the finish line at Maam Cross in 7H36M33S. 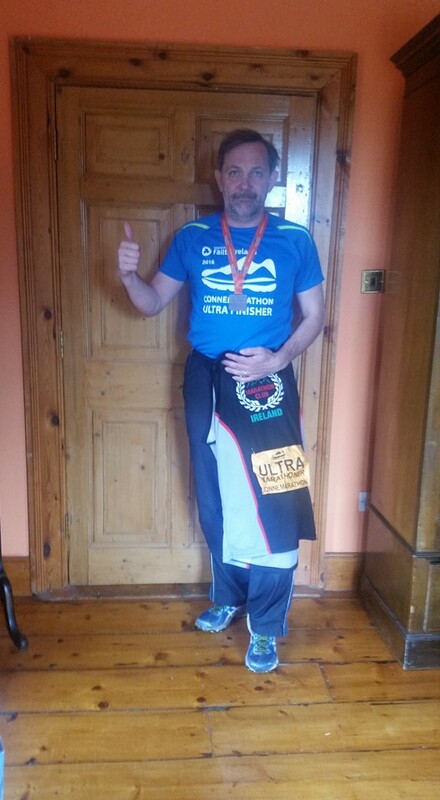 First Ultra done. Definitely up for more! First Ultra done. In horrible weather conditions. I’m an ultra runner. 8 years ago my first run was 0.75 miles and I had to walk back home after that. This was my 41st race at Marathon distance or longer. Because I can, because I love running, because it is fun, because I enjoy it, because my body allows me. My feeling 24 hours later? Achievement, Self Pride and Hope I can do this more often! Sincere thanks to the Organisation, Marshalls, Volunteers, Ambulance crews and Gardaí who kept us safe doing what we love most in horrendous weather conditions. I salute you all! Next?? Great Limerick Run Marathon on May 1st for number 42. Oh and I’m booking my 2nd Ultra this week. Portumna 50K on June 11th. I’m hooked. Thanks Connemara!! 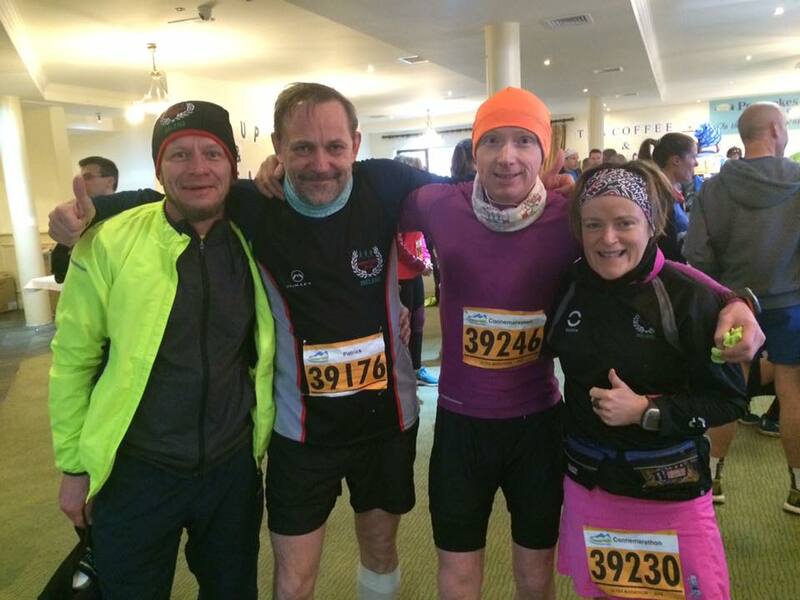 He is a serial runner and he is attempting to achieve 50 marathons before his 50th birthday in 2016.